Learn what it takes to become a Black Belt in Ninjutsu in your own home at your own pace! This revolutionary Ninjutsu Blackbelt Home Study Course pioneered by Senior DaiShihan Richard Van Donk is used by high ranking Ninjutsu instructors and beginning students alike with great success in over 110 countries worldwide. Seven years, 1000’s of hours of research, lots of blood, sweat and tears, and almost ¼ million miles of travel in 50 trips to Japan to personally train with Grandmaster Hatsumi and other Shihan teachers went into providing you with this very comprehensive step by step Black Belt curriculum. There is none like it anywhere else in the world. The elite World Grandmaster Council (WHFSC) gave us the best top International Videos Award in 1999. Find out why for yourself! Train at home on your own time at your own pace! Take total Charge of Your Training and Progress. Anyone that loves Ninjutsu! ….. Art of the Ninja. People who want a life change, personal development, self defense skills, teachers that want new martial art students, family system to pass on, or buddies who want a hobby together, those who train but want more information, to learn faster, those without instructors, those that want to share the art one day with their family or in a dojo, instructors who want a solid progressive study curriculum for students, blackbelts in other arts and schools who want to add Ninja / Ninjutsu skills to their system, knowledge or credibility. Our success tells us that our Ninjutsu Blackbelt Home Study Course will give you the edge you need to become a better martial artist. This is a very comprehensive in-depth course. HOW DO I GET STARTED THERE IS SO MUCH TO LEARN? Click on any link to take you direct. Get started right now by first joining the International Bujinkan Dojo Association at www.BushindoUniversity.com IBDA Membership- you will get an ID card and a downloadable certificate plus many other benefits in the Online Portal that comes with IBDA membership. Then simply enroll in a Ninjutsu Course with us at a local dojo or by obtaining from Bushindo University a distance learning Course. If your an “All In” kind of person and your budget allows it then get the Complete Bujinkan Masters Course so that you have full access to all the teachings from Beginner to 5th Dan Shidoshi teacher level from the start. Those that do this excel the fastest and best. If you are wanting to become an instructor get this course or work towards it. Note: We have a physical Masters Course Binder version or you can get the ONLINE ONLY version which has everything in it. For a limited time when you get the Bujinkan Masters Course Binder Course version we grant you LIFETIME access to the ONLINE VERSION for FREE! Or just Start with the Shodan Course. This also comes in either a Physical Binder Version or an ONLINE ONLY. Enrolling in this course establishes you as a student in our Bushindo University. You are consider a dojo member. You can choose to test with us or not. This is YOUR choice. Before you test fill out and send in your student application – you can find this in the IBDA members portal. Obtain through us or your local martial arts shop a Black uniform with a white belt. You do not need to have tabi shoes, (some do, some don’t). Over time you will need to get or make a few wooden weapons such as a knife, 3ft staff, 6 ft staff and a wooden sword. Start your studies at 9th kyu and study each move on the videos over and over until you can do them easily just like it is on the dvd. Most students take about 3 months at each level, achieving their blackbelt in 2.5 to 3 years of dedicated study. If you are athletic or already have martial arts experience you may go faster through the levels keeping in mind that the basics are the foundations that you build your Blackbelt and advanced levels of training. This Course was carefully crafted over 7 years to give you a natural progression of material after some 20 trips to Japan. Welcome to the Training and let us know how we can help you on your path! CAN I REALLY LEARN WITH THE HOME STUDY COURSE INSTEAD OF AN INSTRUCTOR? First, the dvd’s are your instructor, teaching you in your home or dojo in a step by step way. You can slow motion the instructor and practice the move until you learn it. Try that in a dojo. No intimidation of a class. Go at your own speed. And do it when you have the time. Second, we encourage you to find training partners or a Bujinkan school near you when you feel you are ready to take your training to a new level. For you we have created a unique and very effective video written feedback system that really works. We know because it produces results! Third, Do no believe people that tell you that this does not work. They all have some gain for telling you so (like afraid you will learn stuff that they do not know) or they are just not educated in this learning method. Since 1991, there are countless Shodans, Godans and Judans that started with this our distance learning courses all over the world. Now, every major university in the world is not only offering Online Classes, but also awarding online distance learning degrees. Yes, prestigious Universities like Stanford, John Hopkins, Penn State, North Eastern, Waldorf, Boston U, Yale and even Harvard. IBDA is here to stay! And we are here to help you grow as an IBDA dojo or training groups anywhere in the world. Perhaps you will be the head instructor in your area. No matter if you have a dojo to train in or not – TAKE CHARGE OF YOUR OWN TRAINING! Testing is simple. Upon becoming a registered student we provide you with a list of what techniques to demonstrate while being filmed on video and burnt to a rank testing dvd. Send in your video test on dvd and an upper level blackbelt instructor will carefully review and grade your skills, give you great feedback inspiring your improvements in the areas needed. We’ll mail your certification for 9th kyu to 1st kyu ranks. The blackbelt test must be done in person at a semi-annual camp, seminar, tai kai, dojo or private appointment. This is a real blackbelt and we want your day to be special! ALL OF OUR RANK CERTIIFICATIONS COME FROM SOKE HATSUMI IN JAPAN! Question training with any instructor that claims to be in the Bujinkan if they do not present you with official Bujinkan rank certification. Click on Rank Testing to go to that section for more details and watch a short video on this subject. Nothing is better than sharing these studies with family or a buddy! It is so much fun to have someone you can share this art with. Each of you will inspire each other’s growth. We highly encourage it and we designed a special training plan where you and a friend can share your training at a reduced enrollment price. Family is everything to us. So immediate family members such as your wife, husband or children living in your home can study and test with the same Course. We recommend that everyone has their own training manual and of course their own uniform. Check our Buddy Plan section for complete information. I HAVE XXXX DISABILITY. CAN I STILL TRAIN AND BECOME A BLACKBELT OR SHIDOSHI? ABSOLUTELY! Train as you are and do the best you can. Follow your dreams. There are many Bujinkan BlackBelts and Shidoshi’s that are even in wheel chairs permanently or on crutches. Now you may not be able to do the cartwheels and back flips. Rolls may not look so good BUT you can still train your mind, increase strength in your body, learn how to defend yourself and live the Ninja path. Do not let this stop you. We encourage you to follow and live your dreams. NINJUTSU IS NOT RELIGION. Spiritual Yes. Religion NO. You can train in our art no matter what your religious path is or is not. Please do not confuse this or let anyone else tell you otherwise. We respect all faiths. We have issued blackbelts to people of every faith. Soke Hatsumi emphaticallly respects all faiths and considers his own not limited to one but includes all religions. This art has lasted at least a thousand years and people who trained in it had their own religious beliefs, mostly ones that taught living a natural life. As time goes on cultures change form as do even religious beliefs. Many Japanese families that where once Shinto over time adopted Buddhism and now have converted to Christian. Bujinkan Ninjutsu teachings are worldwide and encompass every religion. Please know that respect, human kindness and helping others are key principles of our Ninjutsu teachings. ABOUT THE BUJINKAN BUJINKAN RULES STATE THAT PEOPLE WITH CRIMINAL RECORDS OR ON MEDICATION CANNOT TRAIN. DOES THIS LEAVE ME OUT? We do not want to leave anyone out as we believe that these teachings can and do change peoples lives. And we abide by the Bujinkan rules as they are meant to be applied. These arts are are not for everyone and they are not for people in prison (or should be), those that have a very bad drug habit or those that are under strong mental supervision. We evaluate yours and all other situations on an individual basis. Someone who has recovered from the mentioned challenges are usually welcomed into the training and as long as they are not hurting anyone else they are welcome to train. We allow everyone to have the opportunity to train with the Shodan course and we reserve the right to deny rank testing and dojo participation. Study the arts and change your life. IS IBDA SOKE HATSUMI’S ORGANIZATION? IBDA under the direction of Shihan Richard Van Donk is an authorized representative of Soke Hatsumi’s Bujinkan teachings and ranks all IBDA students worldwide. Both Kyu and Dan IBDA certifications through Soke Hatsumi’s Japan Hombu Dojo in Noda City. We are your source for authentic Ninjutsu teachings. DO YOU STUDY KOGA OR IGA SCHOOLS? Both. The teachings of the Bujinkan 9 schools inherited by Soke Hatsumi and taught by him to Shihan Van Donk contain information from both of these areas. People like to think of them as clans and some times as opposing clans. Both Koga and Iga are regions of Japan in which families trained in these ancient time tested methods making the Ninja lore and systems what they are today. There is more than what the movies or even history books can teach you as far as accurate information. By the Way, these are the secret arts of the ninja aren’t they. Do you think that the public or the families had the true knowledge of it’s history? DO YOU HAVE A LIVE-IN TRAINING LIKE FOR SEVERAL WEEKS OR MONTHS? CAN I MOVE THERE AND TRAIN WITH YOU? We are in deep negotiations for funding to develop a very comprehensive full time training center that will be built in Northern California or Hawaii (perhaps both). Until then Shihan Richard Van Donk offers private dojo multi-day sessions at his IBDA dojo in Northern California. CAN I TRADE SERVICES OR STUFF FOR TRAINING MATERIAL? Our great desire is to help people learn. Please write or e-mail Bushindo University info@bushindo.com (or just use the contact form on this page) with an explanation of your situation and what skills that you have that could support the University. Also there is an affiliate program so that you can earn $$ towards your study courses. I TRAIN/TRAINED WITH ANOTHER BUJINKAN INSTRUCTOR AND NOW WANT TO TRAIN WITH YOU – WILL YOU RECOGNIZE MY RANK? I NEVER GOT A CERTIFICATE I PAID FOR FROM MY NON-IBDA INSTRUCTOR NOW GONE CAN YOU GET IT FOR ME? We feel you. This happens all to often in the Bujinkan. At IBDA this does not happen as your rank is not official until the fees are submitted into the IBDA office and then Shihan Richard Van Donk personally sends from them to the Japan Hombu office. We ONLY rank students that train with us at IBDA. We must know your ability and rank is also about your relationship with your teacher. Or advice is for you to write to the Japan Hombu, in Japanese, about your situation. I AM A CERTIFED 4TH DAN WITH 15 STUDENTS AND WANT TO TRAIN WITH YOU. WHAT DO I HAVE TO DO? Then e-mail us at info@ninjutsu.com with your name – location – Bujinkan dojo training history and what you would like to have happen in our relationship together. Most likely DaiShihan Richard Van Donk will personally get back to you. I HAVE HEARD GREAT THINGS ABOUT PRIVATE SESSIONS WITH SHIHAN RICHARD VAN DONK HOW DO I BOOK ONE? Please go to www.yourparadigmshift.com all the information is there. HOW DO I BOOK A SEMINAR WITH SHIHAN VAN DONK? Go to the contact page and send a message to the Bushindo office so that they can send you out the Booking an Event with Shihan Richard Van Donk information. CAN I GO TO JAPAN AND LIVE AND TRAIN? Sure, there are many teachers there that teach at the Hombu dojo in Noda or at their own dojos. We urge you to study hard first and get your Shodan before going so that you have enough taijutsu knowledge to fit in the classes first. Then we recommend that you go with a senior instructor to introduce you and and show you all the proper Japan protocols. HOW DO I FIND A GOOD NINJUTSU DOJO? ARE YOUR RANK CERTIFICATES FROM JAPAN? YES, every Bujinkan rank we have ever awarded is issued by the Hombu dojo, as they should be. This will always be the case for IBDA students as long as Soke is alive, teaching and issuing Hombu certification. If yours or someone that you knows are not then you are NOT officially ranked in the Bujinkan. WHAT IS THE DIFFERENCE BETWEEN YOUR BLACKBELT COURSE AND TOSHINDO’S? Well the first thing is that IBDA is BUJINKAN and associated with Soke Masaaki Hatsumi and Mr. Hayes is no longer with the Bujinkan (for about 10+ years). So if you want authentic Bujinkan teachings we offer that. With our course you get rank certification from Japan. 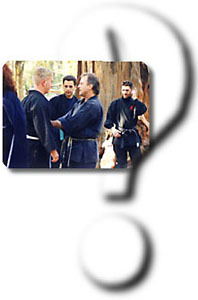 Shihan Richard Van Donk can give the Bujinkan Godan test and Mr. Hayes cannot. We have very comprehensive continued education courses to Judan which Toshindo does not. We feel we offer authentic Ninjutsu as it was taught in Japan by Soke Hatsumi with modern applications while we feel Toshindo is a modernized version and it is NOT what Soke taught or teaches. Mr. Hayes is a good teacher and just offers something different than we do. So to us it is like asking do I buy a Mercedes or Chevy car. That choice can only be yours as your path is your own.